The Rastriya Swayamsevak Sangh’s chief Mr.Mohan Bhagwat says that the RSS as a military network (of the Brahminic forces) can move to the borders to protect the nation within three days while the Indian Army ( multicultural, multi-caste and secular force) will take six months. This is not only dangerous statement of the ISIS kind, but it has serious life implications to all Shudras/OBCs/Dalits and Adivasis. It has very serious implications to the Social Justice agenda that is in operation because of the Ambedkarite Constitution. When the RSS head says its army will go to the borders that means it has already acquired major war weapons into its fold and it has trained its forces. The nation can imagine what they are up to now. This is a massive private army existing in the nation now. The RSS is a Hindu fundamentalist organization like the ISIS is a Muslim fundamentalist organization. Both of them believe in capturing the nations through their private military apparatus. As ISIS does not believe in religious reform within Islam, RSS also does not believe in religious reform in Hinduism. ISIS believes that weaponization of its cadres is the best way to do that. 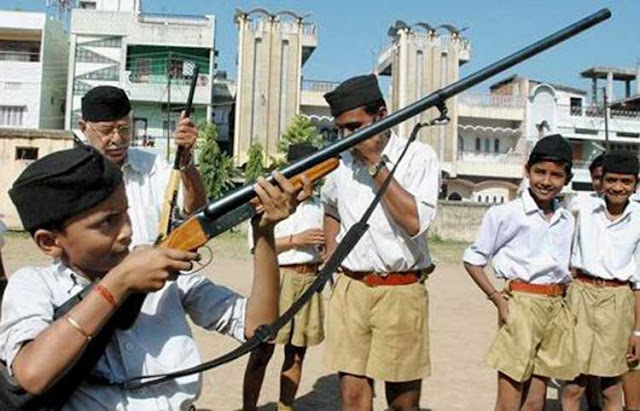 Now the RSS has come out with its true colors and weaponized its forces. Several nations—including India– are paying price for allowing them to grow to that level. When Governments in power allowed such fundamentalist forces in connivance what happens we have seen in Syria. Is India moving on that course? Does not Mohan Bhagwat’s statement indicate that? The RSS never asked for spiritual reforms in the Hindu spiritual system. The Shudra upper castes, OBCs, Dalits Adivasis while living as Hindus cannot head the spiritual centers. RSS does not ask for such reform and work towards castelessness in that system. It is responsible for enacting the cow protection laws and also for the recent attacks on Dalits for eating their historical food. Through by the military means it wants to push back the Shudra/OBC/Dalit/Adivasi masses to the Kautilya and Manu days. The recent attacks on Shudra/OBC/Dalit and Adivasi food culture and opposing their children getting the English medium education point to that end only. There is plan to negate the Ambedkarite social justice process through its militarization. When this organization is challenging the Army itself it can challenge any other structure including the constitutionalism. In this situation we give a call to all those who want to oppose such private armies, join hands and protect the constitutional democracy in India and the constitutional status of our defense forces.